A number of our clients, when progressing through their rebrand projects, are often surprised to learn that their brand positioning statement (also known as their brand essence) and their tagline are not the same thing. And it’s very easy to understand where this confusion comes from. As consumers, we’ve grown up with taglines that are inextricably linked to the brands that we know and love. When I say McDonalds, you hear ‘I’m lovin it!’ When I say Nike, you think you should ‘Just Do It!’ This is because their taglines are drilled into us via TV advertising, print advertising, billboards and store fronts, until our minds are saturated with these messages. The brand and the tagline become synonymous, and so it’s only natural that we would assume that these taglines are no different to the brand’s positioning. But they are different, they play different roles and achieve different outcomes. In the article that follows we are going to explore these differences in more detail so that, as a marketer, you are able to evaluate these two tools in your brand armoury and extract the most value from them moving forward. 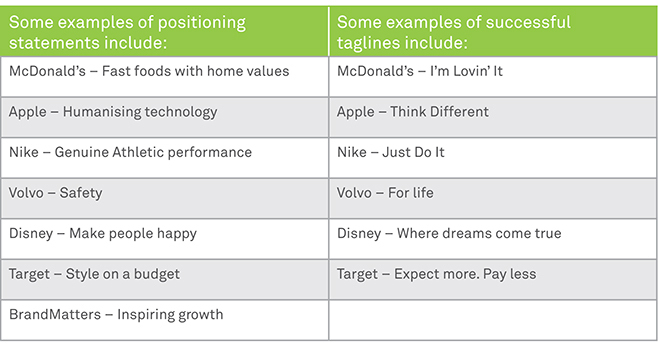 What is a brand positioning statement, or brand essence? A brand’s positioning statement is, simply put, the internal expression of its purpose. Said another way, it is the business’s reason for being that goes beyond simply ‘making lots of money’. This positioning statement sits at the heart of the business and is used to inform sales and marketing strategy, product development, HR decisions, team culture and, as a result, the experience your customer ultimately has with you. The most successful brands have a compelling brand positioning statement that is authentic and, most importantly, true. If you have ever watched a Disney movie, visited a Disney store, stayed in their hotels of visited their theme parks you can see that their reason for being is clearly to make people happy. Their positioning truly is the guiding light of the brand but is rarely publicised externally. A tagline is a marketing tool. It is externally facing and is traditionally accompanied by an awareness campaign such as Nab’s ‘more than money’ or Telstra’s ‘Thrive’. The best taglines are catchy and meaningful and they speak to the benefit of the brand as it applies to the customer. They should also support the overall positioning of the brand but in a way brings to life the benefit of the brand to the customer. Where a brand’s positioning statement is its reason for being, and therefore unlikely to ever change, the tagline can evolve to support new campaigns, product lines, customer segments and so on. Because a tagline is externally facing, more attention is paid to the craftsmanship around the copy; Safety is truly Volvo’s guiding principle, but For Life certainly has more shine to it. To learn more about the role of a positioning statement download a copy of our eBook The Guide to Rebranding. And if you are struggling to define your business’s purpose get in touch with the team to discuss how we can help!